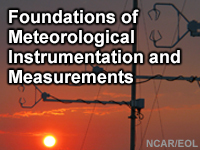 This lesson provides an introduction to the instrumentation used for meteorological measurements. Aimed at undergraduate and graduate students in meteorology and the atmospheric sciences, it examines the types of observing systems available to measure temperature, pressure, humidity, trace gases, clouds and aerosols, winds, precipitation, and radiation. Learners will explore the main components of an instrument and become acquainted with performance characteristics including types of errors. This introductory lesson provides a foundation for more detailed training focused on measurement of specific meteorological variables. Es un muy buen curso de meteorología que nos abre el conocimiento. It would be nice if the lesson was available in Portuguese! Some questions and answers to a couple of the questions with the quiz are obscure in reference of the context within the quiz. The lesson provided a lot of useful info that I could not find in a simple search. Good foundation for meteorological instrumentation. The questions and answers to a couple of the questions with the quiz are obscure in reference of the context within the quiz. For example, the question "Which of the following considerations are important in the context of site selection for global climate observations?" Then you choose all that apply. In the reading, the best answer that stands out is "sufficient distance from urban environments". However, it appears it is not a one answer question, nor does it appear to be any combination of them for a correct answer. Not being an expert on this particular subject by any means, it is disheartening to not know what the correct answers are for proper effective studying or expanding on the material. from this lesson i know to differenciate types of observation, meteorogical variables and types of observing systemscriteria to select a sit and to differenciate to types of error and their causes. I did enjoy this lesson! Very helpful quiz. Learned important information. Too much ambiguity in definitions. Definitions forced on participant without much logic. Rigid sensor system diagram not representative of many sensor systems. Retired ship master mariner have made weather observations on the Pacific and Atlantic Ocean when navigating this areas and send it to AMVER the observed datas. Meteorology tech in general is an growing science, therefore as new measuring methods arise there is always room for improvement. More detailed explanation and notes. The diction of the definitions differs from the diction used by my former school. I use weather instruments for disaster response purposes, not as a weather professional. This is information useful to anyone but the unit so poorly written it was difficult to learn from. It should have a prerequisite of at least two, if not three. This course was recommend by a soaring magazine and I did find it useful for my flying. It gives a good quick view of how meteorological instruments are used and the errors that can occur in them. While not done in great depth, the graphics were sharp and the writing very clear. I would also recommend it for anyone interested in this field. I'm a meteorologist. Found MetEd site just few weeks ago. This is the first lesson I complete and it is really interesting. I've been provided with additional informations to what I already knew. Observation is the first step and basis in weather studies and at this level Instrumentation and measurement is the key. Solid foundation in this field is crucial for a professional like me. This was a useful lesson, however, it could have been somewhat clearer. GOOD SOLID MATERIAL. MORE EXPOSITION AND REPETITION OF MORE COMPLEX MATERIAL WOULD HAVE IMPROVED COMPREHENSION. Very informative. Especially well suited for someone who is contemplating ma career or internship into this field. A very well organized, thoughtfully presented course. Very current and up to date. Linguistic problems to understant exaxtly what is ment in quiz questions. Overall a very good lesson. I would like to see a few more videos with either narration or lecture audio. Balancing reading, interactive tools and multimedia content are the best way to learn, reaching across both active and passive learning strategies. Hi, this lesson is mind opener! there are science (complex) but explainable to a layman and which can be understood. The phobia for this science lie on lack of such good educational materials developed by talented person. Difficult things can be understood. Thanking the team. This lesson was helpful to me because some of the uses of istruments and what they measure, and also descriptions of weather parameters we tend to forget them easily. As always, excellent course offering. Great introduction, now I got a better understanding of what I need to learn next. I hated your new system at first but now that I had some time in using it and working with it. I like it. Thanks for coding it.